Here’s a story about how DOTs can ram through road projects that locals don’t even want. 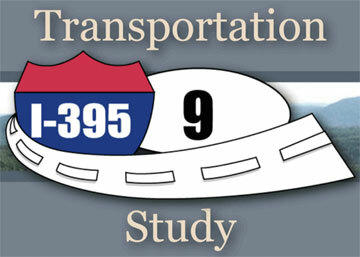 Maine DOT’s jolly logo for a road project nobody wants. Regional planners in Bangor, Maine, say they were forced to approve a highway expansion project because the state DOT threatened to pull all of the region’s transportation funding. The 395-Route 9 Connector is a $61 million project that will link two other highways and speed freight truck trips to and from Canada. Towns in the footprint of the project, which would demolish eight homes, say it’s not needed and the money would be better spent on other things. Maine DOT has not been deterred. Representatives from the Bangor Area Comprehensive Transportation System — the regional planning agency — told the Bangor Daily News they were “held hostage” by state officials who said they would withhold $57 million in region transportation funds if the highway wasn’t approved. The state had added the highway project to its spending plan last summer. But officials in the Bangor area resisted adding the project to their own transportation plan. Without the regional agency’s approval, the state could not get the final go-ahead for the project from the Federal Highway Administration. Linda Johns, who represents the town of Brewer for the regional agency, said the $61 million would be better spent on more pressing local needs and that traffic has declined since the project was first proposed 16 years ago, according to the Bangor Daily News. “Watching this unfold today, in my humble opinion, is precisely why people have lost faith in government,” he said. The goods in those “…freight truck trips to and from Canada” should be carried on railways. But of course the railway companies have to pay their own capital and maintenance costs for the rails whereas the trucking companies get to reach into the pockets of the hard-working taxpayers to pay for their roads. This. The fact that the majority of rail companies had to pay for MRO while driving was subsidized with taxpayer dollars poured into highways is not just a boon for trucking, but is also what killed off many passenger rail services of yesteryear. I really appreciate your coverage of this story. In general, the State of Maine has adopted and implemented a fix-it-first approach to transportation spending. However, this project, along with a few other notable examples, represents the very worst of both transportation priorities and top-down dictates from Augusta. Our state motto Dirigo (I direct)? You bet. Route 9, to which this project will connect, has been a marvelous waste of taxpayer money here. The big Maine metropolis of Calais (pop. 3500) is the largest American municipality at the end of this road. If you look at streetview imagery of Route 9 between, say, Aurora (pop 110) and Beddington (pop 50, our smallest organized town), the scope of the infrastructure is nothing short of shocking for a road which carries only 2500-3500 vehicles per day. As an aside, Maine has invested heavily in its railroad system, including state purchase and rehabilitation of most rail north of Bangor and along the midcoast. We’re also the second-smallest state to support an Amtrak corridor. The ’13 disaster at Lac-Megantic and the recent closure of SIX paper mills has created huge challenges to the hope of a more balanced transportation system in central and northern Maine. Again, thanks for your coverage of transportation news in our corner of the country. What a pleasant surprise!